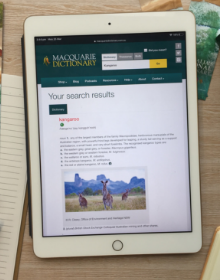 Along with its companion reference the Macquarie Thesaurus, the Macquarie Dictionary Online is recommended for students (and adults) aged 15 and above. There is also the Student access option, which is recommended for students aged 10-15 years. Learn more about the Student access option here. An individual subscription to the Macquarie Dictionary and Thesaurus Online is $49.99, an individual subscription to the Macquarie Dictionary Online is $39.99 and an individual subscription to the Student Dictionary and Thesaurus Online is $44.99. Prices are inclusive of GST and individual subscriptions are for 12 months. If you would like temporary access to the dictionary and thesaurus, you can take out a free 30 day trial (for up to 50 searches) here. Subscribe now or contact us for further information.